This map symbolizes total CyclePhilly trips by facility from May, 2014 through April, 2016 (2 years; 12,202 individual trips by 300 unique CyclePhilly users). Note that this is a map of CyclePhilly trips, not a map of all bicycling in the city and region; CyclePhilly users' trip patterns may not reflect those of all cyclists. This map symbolizes total CyclePhilly trips by facility from May, 2014 through April, 2016, with most trips being logged during May to October promotion periods in 2014 and 2015. Raw CyclePhilly trip data was processed and snapped to the nearest road or trail segment using a special algorithm so that total volumes by segment could be calculated and compared (some facilities--particularly park trails--may not be in the mapped network; CyclePhilly data for these segments is not shown). Trip ends have been obscured to protect users' privacy. To access DVRPC's full pedestrian and bicycle counts portal, click here. 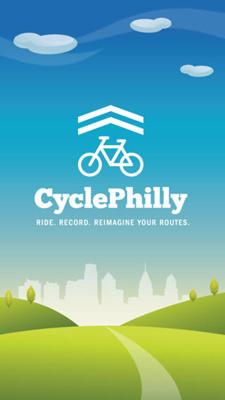 CyclePhilly is a smartphone app for recording bicycle trips. Data from the app can be used by transportation planners in the Philadelphia region to make Philly a better place to ride. CyclePhilly was developed by Code for Philly , a group of citizens working to harness the power of technology to modernize citizenship in Philadelphia. Visit the CyclePhilly website to learn more about the app and the team. This web page is a public resource of general information. The Delaware Valley Regional Commission (DVRPC) makes no warranty, representation, or guarantee as to the content, sequence, accuracy, timeliness, or completeness of any of the spatial data or database information provided herein. DVRPC and partner state, local, and other agencies shall assume no liability for errors, omissions, or inaccuracies in the information provided regardless of how caused; or any decision made or action taken or not taken by any person relying on any information or data furnished within. These datasets contain CyclePhilly trips from May, 2014 through April, 2016 (2 years; 12,202 individual trips by 300 unique CyclePhilly users) that were mappable to DVRPC's Open Street Map facility network. CyclePhilly trip data was processed and snapped to the nearest road or trail segment using an algorithm so that total volumes by segment could be calculated and compared (some facilities--particularly trails--may not be in the mapped network; CyclePhilly data for these segments is not shown). 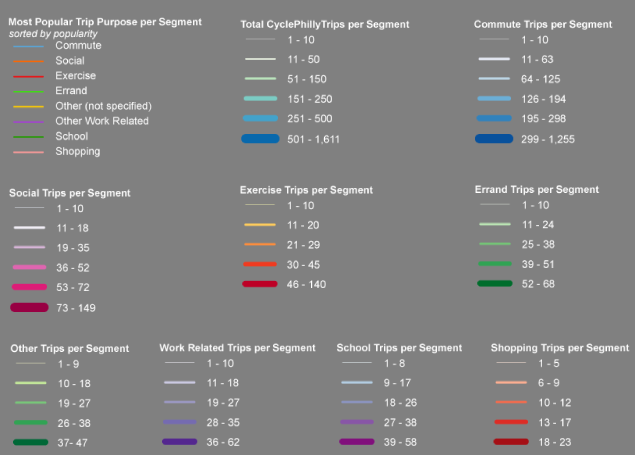 Note the data sets include only CyclePhilly trips; CyclePhilly users' trip patterns may not reflect those of all cyclists. Trip ends (origin/destination) have been 'fuzzed' to protect users' privacy, so true start and stop locations are obscured in these datasets. Please refer to the descriptions below for information on the datasets; a data dictionary is also included within each ZIP file.